I was always a bit wary of wearing black and blue together. I think the rule is black and navy though? Right. I don’t know, but I quite like how it looks. I picked this denim button up dress in the Primark sale for a mere £5. I wasn't too sure about it originally, but my Mum was rushing me so I decided to get it anyway. I don't really like light denim, but at the same time I really liked this. It reminds me of something Alexa Chung would wear, I think I just needed a little nudge in the right direction! Today is one of those days where my hair looks crappy. I still haven’t gotten the styling routine down yet so I literally have no idea what the correct way to style it. I think I use too many products that I use to use on my old hair, its so weird that my whole hair type has changed pretty much overnight! It looks a bit blocky. Hmpft. Lego haircut anyone? 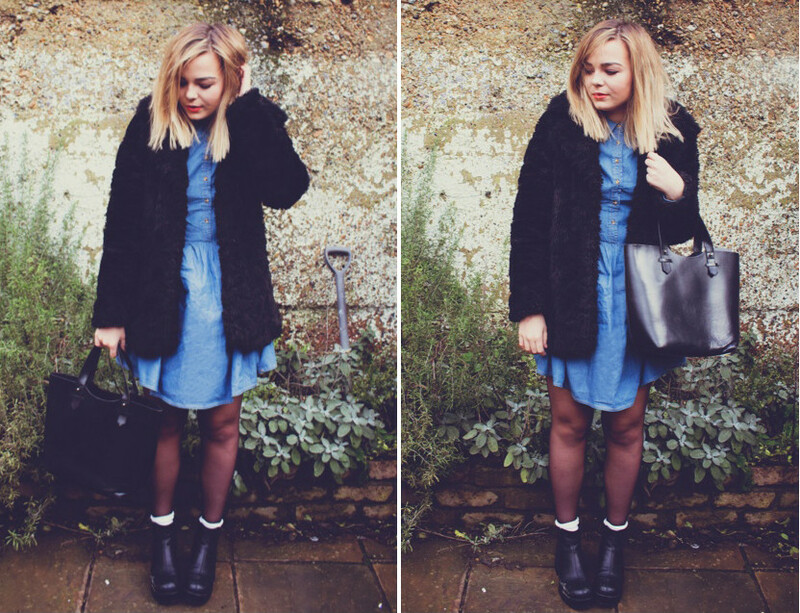 Love a good denim dress! love the way you styled it with the black coat! Love the dress, and for that price you can't really go wrong! This is very cute! I love a summer dress in winter. Lovely outfit and I like your two week return rule, think I should start doing that! You found some amazing clothes in Primark sale! i'm excited to got to primark tomorrow, hope to buy such a dress like that, too! I love the dress paired with the boots, casual mixed with chic! love how you styled the dress, so cute! topshop fur coat is so gorgeous! I actually like your hair this way Lily! Love the outfit! Always thought denim (besides jeans) were things to wear in the summer, not winter, but I'm going to try raid my summer wardrobe for some denim pieces after seeing this. Looks gorgeous on you, thanks! Love this outfit, the dress is gorgeous, i wouldn't normally go for light denim either! Your hair so isn't lego-ish either, it's gorgeous! Oh, I LOVE that coat/jacket. I'm not usually a fan of sheer stockings, but these work. I think a belt would give the dress a whole different spin, to keep it fresh. I like the combo! And your hair looks good to me! It's such a pretty dress, bargain too! The dress is a bargain and super cute - winner! The combo of your hair and lip colour is beaut! love this, and i love your hair in this!!! I totally get what you mean about your hair issues - I just got my longish hair cut to about the same as yours and I have literally no idea how to make it work! I'm looking into pre-blow-dry volumising texturising things and styling it into wavy curls more than I used to (which was never). Please make a post/video if you work it out! Haha I suffer from lego hair too! I got 'The Blogger Cut' back in the summer, but recently went shorter. My hair is naturally super straight, and sometimes it just sits...wrong. Such a pain. It's quicker to wash and dry, but the time I spend actually making it look ok I swear is waaaaaay longer than before I went for the chop! I love the white socks poking out! Can't believe that dress was only £5, bargain! Such lovely style, don't be silly your hair is amaze! Love that dress, you find the best primark finds!! I really like this messy-ish look you got going on (even though you think it looks crappy). and screw the rules about black and blue (Although I think it is black and navy). You look awesome! Very nice way to "winter" a denim dress...love it! Beautiful! Makes me want to take my denim dresses back out of my 'clothes put away for summer' storage! Great mix and match in this outfit.